A small pale, almost ghostly, wader that is frequently seen running in the tide edge on beaches all around the Wash, rather like a group of clockwork toys. Its distinctive running action arises from the fact that, unlike other waders, it has no back toe, only the three forward facing ones. Sanderling are high Arctic breeders, with birds that visit Europe breeding in northern Greenland and Siberia. 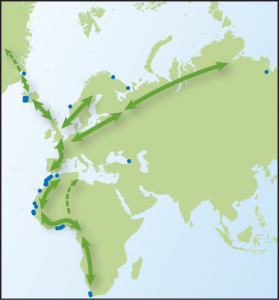 Birds pass through The Wash in autumn on their way to wintering grounds in southern Europe and the coasts of Africa. Sanderling are primarily winter visitors to The Wash, but the first birds can arrive back as early as July and some do not leave until May, so a few birds can be present almost year round. The number of Sanderling caught on The Wash, by month, between 1985 and 2016. Sanderling, as their name suggests, prefer sandy beaches, so are commonest on the eastern shore of The Wash and can usually be seen on the beaches between Snettisham and Hunstanton. Sanderling feed along the tide edge, watching for small marine crustaceans or molluscs, or drowned insects, washed up in the waves. They will also probe the sandy sediment looking for small clams, snails or worms. 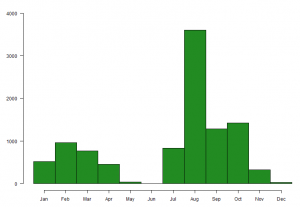 As the graph below shows, the number of Sanderling caught each year varies. Some annual fluctuations are related to the success of catching attempts rather than being representative of the number of birds present. 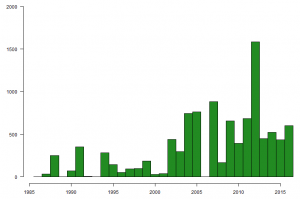 The number of Sanderling caught on The Wash, by year, between 1985 and 2016. This bird also holds the record for the oldest Sanderling to be ringed in Britain & Ireland. 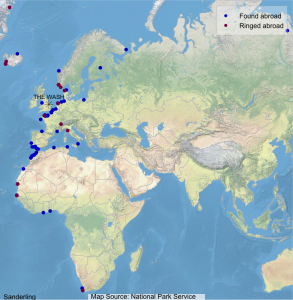 The following map shows where Wash-ringed Sanderling have been found abroad (blue dots) and where foreign-ringed birds that have been encountered on The Wash were ringed (maroon dots). The graph below shows the average weights, by month, of Sanderling caught on The Wash between 1985 and 2016. The thick horizontal line gives the average weight and the box indicates the middle 50% of weights. 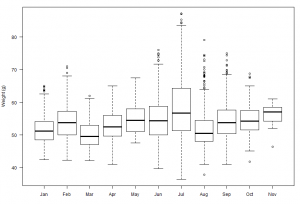 The thin vertical lines indicate the range of observations, with the circles identifying the most extreme values.